Green Bean and Radicchio Salad With Walnuts. (Photo by Tom McCorkle for The Washington Post). 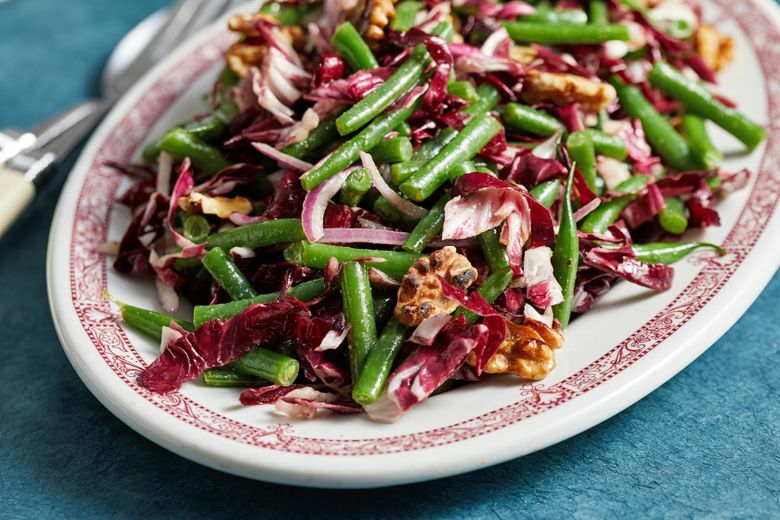 Green beans, radicchio and walnuts aren't things you'd think to throw together. But these seemingly random items come together beautifully in this hearty winter salad. I get an incomparable rush from MacGyvering dinner. The gratification of making something wonderful from random bits in the refrigerator is so great that I’d go so far as to say I prefer it to cooking with a fresh grocery haul. This colorful, hearty salad is case in point. One evening I found myself staring down a near-empty refrigerator with just some steamed green beans leftover from a previous meal and a lonely wedge of radicchio. I probably would not have otherwise thought to put these two ingredients together, but serendipity did it for me. I cut the crisp, cool beans into bite-size pieces and sliced thinly the radicchio. As I tossed them together, I took pleasure in how their hues, textures and tastes played off one another so perfectly. Then I reached for some pantry staples: Red onion to add a zingy bite to the salad, and oil, vinegar and mustard to make a robust, tangy dressing. I thought some crunch was in order, so I toasted some walnuts (which I pretty much always have in my freezer) and tossed those in at the end. The result was unexpectedly delightful, a bold winter salad that is now in regular rotation in my home, where I find it provides fresh contrast and stands up beautifully to stews, braises and roasts. It’s a dish born of circumstance, but one that is well worth planning for. This colorful and hearty winter salad combines crisp green beans, peppery ribbons of radicchio, red onion and toasted walnuts in a robust mustard vinaigrette. 1. Bring a 3- or 4-quart pot of water to a boil over high heat. Fill a large bowl with ice cubes and cold water. 2. Add the green beans to the pot; cook for 2 minutes, then transfer the green beans to the ice-water bath for 1 to 2 minutes (to stop the cooking and fix their color). Drain and cut the beans into 11/2-inch pieces, placing them in a large bowl as you work. 3. Toast the walnuts in a small, dry skillet over medium-low heat for about 4 minutes, shaking the pan frequently to avoid scorching, until they are fragrant and lightly browned. Cool completely. 4. Meanwhile, whisk together the oil, vinegar, mustard, salt and pepper in a small bowl to form an emulsified dressing. 5. To serve, add the radicchio and red onion to the bowl with the beans, tossing to incorporate. Drizzle with the dressing and toss to coat, then add the walnuts.